My trusty old T42P has just received a partial restoration - motherboard swap to the original (mobo was replaced in '09 due to physically damaged USB port/password, but new mobo ended up having broken USB), replaced USB port, keyboard, keyboard bezel, CMOS battery, and CardBus slot (bent pin) along with a deep cleaning. An mSATA SSD is on the way, and I've got an mSATA<->IDE converter with the better behaving Marvell chipset. It's working well aside from one thing - the CPU lacks the PAE/NX capabilities required for Windows 10. My goal (for purposes of fun and nostalgia, mostly) is to get 4 different versions of Windows booting. Windows 98 SE, Windows XP Pro, Windows 7 Pro, and Windows 10 Pro. However, I've run into an error with the Windows 10 install due to aforementioned issues with the CPU (currently a Pentium M 745 @ 1.8GHz). I've scoured forums far and wide, both here and elsewhere, even some foreign language forums via Google Translate. From what I've seen, the 745 A is a bit of an oddball. Checking the Linux driver (drivers/cpufreq/speedstep-centrino.c), there are *still* no references to the C0 stepping CPUs, meaning that the patch described several years ago would still be necessary. NHC was suggested for XP (and Windows 7?) to properly scale the CPU frequency. The BIOS would not contain the proper microcode either. It seems it might be possible, but modding the BIOS to replace the microcode blobs in it seems risky at best. The 780 would require some sort of pin mod to have it run at the correct 533MHz bus speed. I imagine it'd also suffer from the same issues with missing microcode. I've seen a guide to overclock the older Dothans from 400MHz -> 533MHz, but am unsure if the same mod would be sufficient to have an 780 run at 533MHz in a T42P. Has anyone out there completed such a swap successfully and got Windows 10 (or unmodded Windows 8(.1)) running on a T42P or equivalent? If so, which CPU and steps did you take to get things running smoothly? I do not want to swap the motherboard with e.g. one from a T43. My ideal solution would be to replace microcode in the BIOS with that of the swapped CPU, and to have frequency scaling being done by the OS without a userland utility (e.g. NHC). I understand that there's no real point to any of this (the laptop is old and slow, even if it's now shiny). The laptop does have significance to me, though, and with the Thinkpad Dock II I just got, it could be useful for running certain older programs/utilities that don't behave well on UEFI/64-bit systems. PM 780 will work, with or without pinmod (only required for it running at 533Mhz) and you should be able to install W10 without issues. You can pick up a PM750 for $5 and give the concept a test drive. I don't run W10 but would imagine that NHC would work, I have it running in W7 on my T43pSF. Q: Can I use my 533 mhz processor to do the Pinmod? A: No you need a 400mhz processor for it to work. That makes me wonder if there's a separate pinmod for swapping in native 533MHz CPUs. I was also wondering - will the CPU power utilization be the same if it's running with the same multiplier at 400MHz vs 533MHz? Or will the max TDP be 75% (400 ÷ 533)? I'm thinking it would use less power but am not certain. If the CPU selects voltages based on the multiplier irregardless of which FSB it's running at, then it seems it would use significantly more power MHz for MHz. Hopefully someone can chime in about modding the BIOS with correct microcode. It'd make sense for the microcode to be loaded based on CPU ID metadata attached to each blob, but they might not have done it that way. In that case simply replacing the blob wouldn't be enough I think. I'm afraid that I've got no wisdom to offer here since I've never done either of the pinmods myself. As I've said in the previous post, spend $5 on a PM750 and you'll know where you stand in general terms. The only BIOS mod that I'm aware of when it comes to T42 (and previous T4x models) deals with whitelisting the wireless cards and SLIC 2.1, not with any added microcodes and stuff like that. Yep, I saw discussion of a microcode mod and perhaps someone bricking their laptop by attempting it, but no reports of success. There are existing utilities for Phoenix BIOS (e.g. PhoenixTool) to do things like SLIC mod - I don't know about microcode though. I've had success doing that on newer UEFI firmwares. I did find the no-1802/SLIC BIOS several days ago after much searching. Someone was kind enough to re-post it on these forums here. It'd fallen off the net - those fly-by-night file sharing sites aren't reliable long-term storage. It's working fine. I have a hardware flasher setup. If I do end up attempting to mod the BIOS myself, I'll make sure to keep a dump of the flash beforehand. I doubt anyone has, unfortunately. Although I did have an R50e that was using a Pentium M 725A to run Windows 8.1, but that was ages ago and I can not exactly recall the details well. Yes, but that guide was only meant for laptops equipped with an Intel 82915PM or an Intel 82915GM memory controller hub. The T42(p) and before were equipped with an Intel 82855PM memory controller hub, which does not officially support the 533MT/s front-side bus speed. There isn't a separate pinmod meant for swapping in native 533MT/s processors either; the BSEL pin mod is the only way to do that. Another way to force it to run on the unsupported 533MT/s bus, is to bridge a connection between pin 55 and pin 54 on the phase-locked loop chip. However this will overclock your RAM, so it was not advised as much as a pin-mod would have been. No, it will not be the same because of the increased clock speed. The multipliers themselves do not change the power consumption, but the clock frequency and voltage does. The theoretical maximum TDP is not a way to measure power consumption, it was meant to measure the heat output (in watts) from the processor. If you want to measure power consumption, download the 533MT/s Pentium M datasheet and get the IccMax values multiplied by voltage. This is the correct way of measuring the theoretical maximum power consumption in watts. The processor does select voltage values based on the multiplier setting, but it is only meant for a few and not all multiplier settings if I recall. The 1.6GHz Banias that I have in my R40, seems to do that. Slightly more power though, the clock speed does not cause the power consumption to rocket through the roof. The voltage is the major factor that does that. I took the R50e's microcodes out and placed them in the T42's ROM, here is the modified ROM. You might be right about it not being enough, but I believe it should work. Remember though, I can't be held responsible for a brick. If it ends up as a brick, you have my apologies. EDIT: Uh, I think it is recommended that you don't flash the BIOS with the ROM that I have provided. Recently I have noticed some posts saying that the C0 stepping/6D8 Dothan processors, mainly the 725A, 735A, and the 745A, seems to work. The only problem is a non-functional SpeedStep, which means the processor will always be running at its lowest multiplier (6x100) or 600MHz. I suggest buying the 745A as you mentioned earlier, or go with a Celeron M 370/380/390. The Celeron M 370/380/390 processors always have NX and PAE enabled, and should be mostly cheaper than the Pentium M 'A' revisions. Last edited by Screamer on Sat Oct 20, 2018 1:30 pm, edited 1 time in total. At this point I think replacing the motherboard with a T43p one makes more sense if you plan to do the BIOS mods anyways. But a T43p would only run Windows 10 1607 well. Older versions aren't as matured and newer versions have problems with the ATI Radeon drivers and DirectX 9.0, while the latest 2 versions give you a BSOD for some odd motherboard compatibility issues. If you plan to install Windows 10 1607, make sure you install it without any internet connected and then disable windows update right away. I don't think you can get NX and PAE working on a T42 motherboard as the motherboard itself doesn't support it. Thanks a lot for the detailed reply, this is extremely helpful information. I see some discussion of the 133MHz PLL mod here here, but unfortunately the linked images have disappeared. Searching for the specific PLL chip (ICS950810) brings up this post (in Chinese) at thinkpad.com. Thankfully, there is an image of the PLL chip there. 1.) Bridge pins 54 (FS0) + 55 (FS1) on the ICS950810. 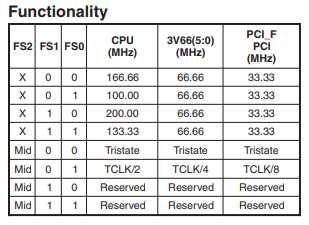 This corresponds to the 133MHz on the table from the ICS950810 datasheet (see below). 2.) Optionally flash SPD of the RAM so it runs at a lower speed (which ends up being the correct speed when the PLL is modified). 3.) Possibly mod BIOS to include correct microcode. This makes the 745A more appealing as it's not just a matter of putting a bit of wire jumper in the CPU socket as I'd hoped it would be. I would prefer *not* to swap out the motherboard. I just completed a tedious swap and USB repair of the laptop's original motherboard and was hoping to keep at least that much intact. Regarding ATI drivers (for the FireGL Mobility T2), I had some fun modding the DriverHeaven Mobility Mod tool to properly alter the last Vista legacy release so they'd install on Windows 7. Here are the modded files (to be placed in Mobility Modder's Program Files directory, replacing the original files by that name). Maybe it'll end up being useful to someone down the road. I realized after the fact that I didn't do it quite right, but maybe once I get to reinstalling Windows 7 on the SSD I'll make a cleaner bundle. Before you do go along with the phase-locked loop chip modification, be aware that this is not the only phase-locked loop used in the T4x series. Other than the ICS950810 chip which I do find a little common, the CY28346ZI-2 chip is another potential phase-locked loop that may show up in a T42. The pin-outs for the CY28346ZI-2 chip, looks identical to the ICS950810 chip's pin-outs. In other words, don't worry about the pin-outs being different, they are the same. The only difference between these 2 chips, is that the CY28346ZI-2 is capable of being overclocked by using SetFSB, whereas the ICS950810 can not be overclocked with SetFSB or with any other program that modifies the phase-locked loop's frequency divider. Step 1 seems right, but step 2 lacks a little information on the lower speed part. According to my previous experiences with a friend of mine that forced his R51 to use the 533MT/s bus speed, he always made sure that the RAM's speed is set to DDR266 using SPDTool. I believe this results in a DDR speed of approximately DDR355 (266.66 x 1.33), in comparison to the original untouched DDR speed of approximately DDR443 (333.33 x 1.33). DDR355 isn't exactly the correct speed; just a stable speed that is far less likely to induce instability. Although I would strongly recommend to get a pair of DDR400 modules in this case, because DDR355 is still in the overclocked range for DDR333 modules. As for step 3, give me some time to let my R50e be a guinea pig for microcode swapping. That is if you don't mind, because I don't think it is right giving you the extra work required to revive your T42p if the modified BIOS fails to function. Even with a hardware flasher, I would imagine that is still tedious to do. EDIT: Should work, here is the modified ROM with support for the C0 stepping Dothan. There is only one drawback however; this BIOS can no longer accept an A0 stepping Banias, but the B1 stepping Banias is still accepted. Good luck with the BIOS flash, I hope it works. Last edited by Screamer on Tue Oct 23, 2018 11:49 am, edited 1 time in total. How well in the end does that work though? I didn't bother with it because I have the Radeon 7500 inside my T42 and R51. Does that allow the older versions of Windows 10 setup to at least boot? And also I heard that if you are still considering Windows 10, the older AGP interface has more bugs in Windows 10 than the newer PCIe interface used in T43p motherboards. Got it, thanks. I'll probably go with the bridged pins mod instead of using something like SetFSB, but good to know. I took a couple pics of the motherboard before I put it back together but I can't positively ID the PLL. Here is a gallery with a couple pictures of the board. You can zoom the images with a mouse wheel. I think I see an ICS chip to the left of the Intel chip, below the FireGL chip. I'll make sure to get better pictures when I open it back up. If I can find a cheap pair of DDR400 I'll go with that, otherwise I would at least make sure that it's stable. Thanks for testing that. I'm taking a look at the differences between a hex dump of a backup made with the WINPHLASHER and the latest T42.ROM that you provided. There seems to be large differences between the two. I'm thinking some of it might be the CMOS configuration, some must the microcode, some appears to be the SLIC tables, and I'm not sure if yours had the no-1802 built into it either. Ideally I'd like to merge those differences (at least the ACPI tables and no-1802) into the final image I flash. I see a couple tutorials on how to update microcode in Phoenix images. There appears to be a utility cbrom195.exe detailed here, and an official one called Phoenix Bios Editor that is apparently a manufacturer utility. Did you use either of those or do something a bit lower level? If needed I can dump current copy with WINPHLASH and upload it somewhere, or use the steps you took to insert the microcode into the dump. The version of 1RETDRWW that I flashed and have been using is located on these forums here. I got the legacy Vista drivers working OK in Windows 7 after using a modded Mobility Modder. From what I understand those should also work in Windows 10. It wouldn't be the end of the world if I wound up needing to use a generic driver, though. The last drivers released by IBM/Lenovo for this FireGL Mobility T2 were some ancient XP drivers. I checked the Lenovo China site and found the same there - nothing for Windows 7 or newer. As I'd mentioned I used modded "official" drivers from amd.com - those are the newest in existence AFAIK, and mostly identical except for the included .inf files. In other news, I've successfully completed the first few steps of getting Win98SE and XP Pro dual-booting. I found the correct version of XP SP3 OEM and was able to activate it using the COA sticker on the bottom of the laptop. I did run into a snag with Windows XP seeing its own drive as D:\ instead of C:\ due to the FAT32 Win98SE partition being visible to it. I worked around that today using a bootloader called Plop Boot Manager which very conveniently will re-write the partition table depending on which OS you've selected from the menu. Win98SE sees a single, bootable FAT32 primary partition located between 12-16384MB. WinXP sees a single, bootable NTFS primary partition located between 16416-49184MB. The odd gaps are to keep things aligned to 12MB chunks, which has been considered "safest" for the flash layout (erase block etc.) on the Samsung Evo SATA drives. From what I understand Windows 7 and Windows 10 are a bit smarter than XP/98 in terms of recognizing which is their boot drive - but I will probably use Plop to isolate those from each other as well. Does your computer boot Windows 10 1607? You said you modded the motherboard to enable PAE and NX, and that is a good way to test whether your mod worked. Well the downside with these newer Sonoma CPUs is that they run at a higher TDP and they give much shorter battery life. I remember my T42 lasts about twice as long as my T43p under light tasks such as PDF reading. You can notice the higher TDP when you are running modern applications that give the CPUs a good workout. So I guess in that case, it's your choice to either undervolt or overclock with SetFSB if you want more performance. I chose to go with undervolting it and it makes a pretty decent difference in terms of battery life both when idling and under full load and so that my V3200 graphics chip doesn't fry. I haven't tried 1607, but 1809 boots to an error screen after a fairly long timeout. IIRC it specifically mentioned PAE, and the issue goes as far back as Windows 8.x. No mods to the motherboard have been done yet aside from replacing the USB port. The CPU is the real thing holding me back, though. It'll be a C0 - not sure which one yet. I took a couple pics of the motherboard before I put it back together but I can't positively ID the PLL. Looks like an ICS950810 to me, even with the poor image quality. If you were to use the same DDR333 modules, you would need to loosen the timings using SPDTool. I can't exactly remember how loose the timings had to be to bring it to a stable state at DDR355 though, but it was definitely dependent on the DDR333 module for sure. No problem, but I can't assure you that it will allow the C0 stepping Dothan processors to utilize their NX capability. Part of the NX capability has to be handled by the BIOS, if I am not wrong. It can also be forcibly enabled by manually setting bit 11 in the processor's model specific register named 0xC0000080, but I don't think that might be possible. The winphlasher backup ROM might be a little different from the stock flashable ROM, at least that is what I noticed on my end. It is no CMOS configuration difference as far as I know, but it is more of how the backup ROM doesn't contain the flashable binary that allows the ROM to be flashed using a BIOS update utility. I don't think the backup ROM thing applies to every BIOS in existence though, because some backup ROMs look identical to their stock flashable ROMs. The BIOS that I have provided is actually a minor edit based on the no-1802 + SLIC 2.1 BIOS that you have currently on your T42p, I forgot to mention that. I did not use cbrom195.exe or Phoenix BIOS Editor, but yes, I did use something that is very low-level. I used HxD to modify the ROM and to get the microcodes swapped, it actually works very well for that purpose. On the other hand, cbrom195.exe is a hit or a miss, because some BIOS images do not support it for some reason. Phoenix BIOS Editor, generally only works for editing BIOS images made before 2006. I think it has something to do with the BIOS' structure or the compression method used to compress the BIOS, at least for the newer BIOS images. It is a tad bit annoying to swap or add microcodes with it though, which is why I typically use HxD for BIOS editing. Thanks, I've got the cheaper of the 2 in my cart - both Singapore Micron chips and the cheaper one actually advertises a warranty. ePacket on both. I'll probably get those Crucial DIMMs and leave the existing ones untouched so I can fall back if I run into unsolvable issues with the 533MHz or overclocking mods. I actually realized that the Winphlash dump was a backup I made before flashing the modded BIOS, and I got the two hexdumps reversed when I diffed them. Sorry. I'm strongly considering getting the M 745A, but for just a few bucks more I can pick up an M 770, so I'll probably get both. I think those and the RAM should give me some flexibility to find a stable configuration. eBay has a 10% sitewide going on in the Americas until 8AM (6 hours from now) which makes it even more enticing. Edit: 745A, 770, 2x1GB 400MHz Crucial Ram, and a replacement MCF-205AM05 fan are on the way (should have the right hole/tab layout, "Made in Japan" etc. - most of them are for the newer T43 cooler it seems). It'll be a few weeks before most of it arrives, but the 745A should be here in a week or so. I might wait until the other parts get here before I pull it apart again. I see, that is ok. Was the modded BIOS, the BIOS with the Dothan C0 microcode I gave you in the previous post, or was it the BIOS without the Dothan C0 microcode? I was wondering if it worked. Good idea, but why pick the fan from the T43? 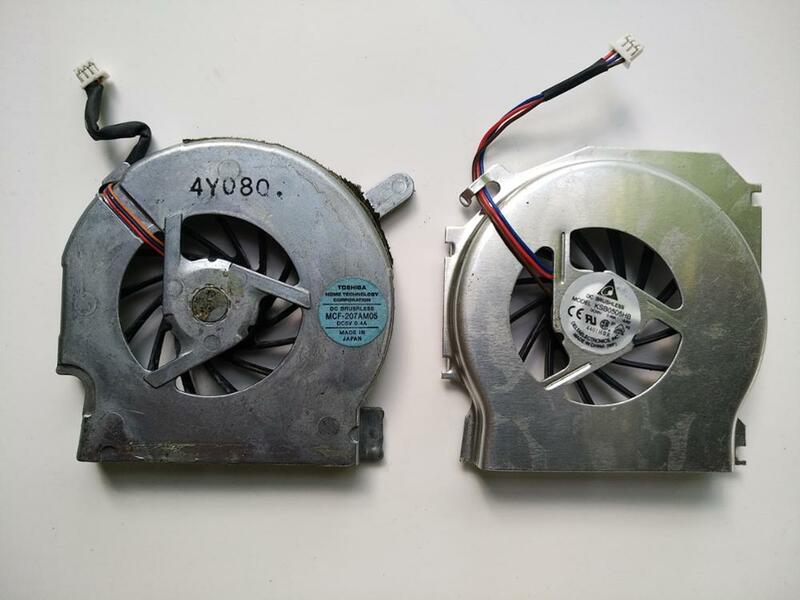 The only advantage it has in comparison to the T42's fan, is a higher maximum fan speed and a higher cubic-feet-per-minute rating. I am sure that it isn't the motherboard alone that decides or limits whether if PAE or NX can be used, it should be reliant on the BIOS and the chipset for it to properly support that. Assuming that the processor's registers can be edited before the installation of Windows 8.1/10, it should be possible to run it on a T42. Or, even on older platforms like the T41 and the T40. As for NX, that should mostly depend on the BIOS if I am not mistaken. Intel did mention that NX is recommended 'only' for the 915/910 chipset derivatives, but I believe that is just a recommendation and not a strict requirement. In any way, even if the C0 stepping Dothan processors don't display their NX capabilities or just have it disabled, it should be theoretically capable of being enabled by modifying the register 0xC0000080 on the said processor. I used that method of enabling NX on my G1 stepping Prescott ages ago, and that if I can recall right, worked. Though, I only tested that in Windows XP (with data execution prevention) and I don't remember using 8.1 or 10 for that matter. Just a heads-up if anyone is interested in this PGA478 Prescott; it was a limited-production run unit that had EM64T and NX capabilities enabled on it for some reason. The S-Spec for that particular Pentium 4 was SL8JX. I meant to say I picked up the harder to find one on the left, which should actually fit my existing heatsink. Edit: convert inline image to external link. Last edited by surrealmode on Sat Oct 27, 2018 12:01 pm, edited 1 time in total. Ah, no wonder. That outright confused me, I wasn't aware of the strange fan replacements that had incompatible mounts. Thanks for the clarification. Also, you might want to remove the image and convert it into a link. The forum rules state that any images used in a post, should be below the 50KB limit. Well and it also have the downside of being a lot noisier because it spins faster. Since the T4x series have their fans turned to max speed during BIOS (Fan 64 mode), a T43p sounds like an aeroplane when it is posting. But if you wanna use a Pentium M 7x0 series CPU and a FireGL T2 on the T42p at the same time, the only way to keep it from throttling is to use a T43/T43p long fan or undervolting the CPU and use high quality thermal compound. I have all the parts (both CPUs, replacement fans, memory) and disassembled the T42P to the point of removing the heatsink/fan. I was *hoping* it'd be simple to remove the old fan from the heatsink and install the replacement bare fan I got. The fan seems to be wedged in there pretty good. Before I take a heatgun and remove the metal foil tape and yank on it, does anyone know if it will even come loose? If it won't, I'd rather not break the one I have as new identical replacements (i.e. not the T43 model heatsinks) are very difficult to find and expensive. Note, I removed the last of the crumbling bits of foam/adhesive from it. It wasn't airtight and just falling apart and leaving residue everywhere. The little potmetal pins are mushroomed over keeping fan in place on the copper plate holes. Just use a sharp flush wire cutter and shave the tops of mushrooms off then fan will come free. Or use a sharp small drill and punch to start. Just enough to take off the peened over top of pins off. Flush cuts would probably do the job too. I know I use them alot for those kind of tasks. Thanks, I tried the flush cutters route - while I was able to remove some of it, it wasn't enough. It was almost flush with the copper as it was. I'll try to drill. The preferred image sharing platform here is imgur. Google is known for causing hassles with image sharing.